Mulroney says Wilson’s efforts as finance minister in the 1980s had a “transformative” impact and set the country up for decades of future success. That includes everything from helping to negotiate the Canada-U.S. Free Trade Agreement and, later, the North American Free Trade Agreement, to deregulating Crown Corporations like Air Canada and Petro-Canada. Often the policies Wilson pursued weren’t politically popular – including the creation of the GST, which replaced a costly hidden manufacturers’ sales tax that made Canadian exports uncompetitive. “He and I agreed on pretty well everything,” Mulroney told U of T News in the wake of Wilson’s death on Sunday at age 81. It was a principled, long-term outlook that seemed to guide Wilson in everything he did – both in and out of politics. An alumnus of Trinity College, Wilson was first elected as U of T’s 33rd chancellor in 2012 and served a full two terms. 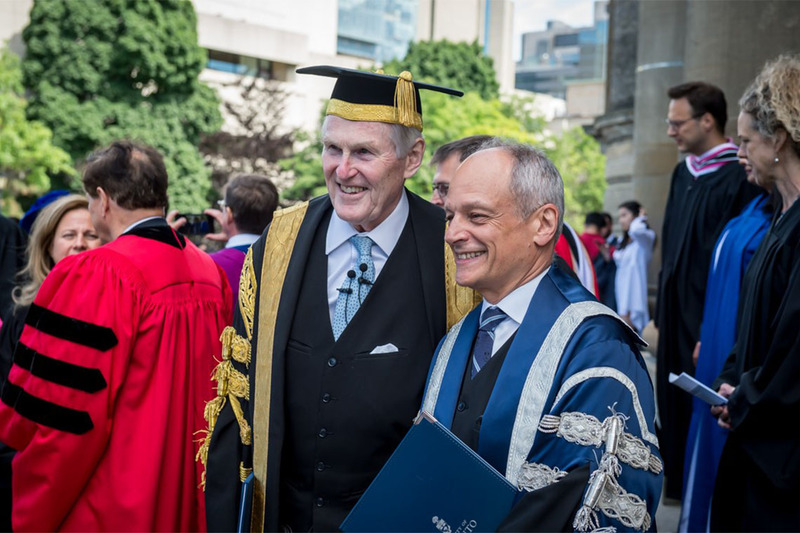 In the role, he not only helped chart a course for the university’s international ambition, but acted as U of T’s ambassador to more than half a million alumni around the world and presided over scores of convocation ceremonies. It was the part of the job he loved most,” U of T President Meric Gertler said during an interview on CBC today. Wilson also made an indelible impact in the realm of mental health, particularly after his son, Cameron, took his own life in 1995 at the age of 29. At the time, it was rare for people of Wilson’s generation to speak openly about mental health and grief. But Wilson felt the need to do everything in his power to help. “One of the things that was said to me is that, if I’m willing to tell my story, I will get a lot more exposure than someone who hasn’t spent 14 years in federal politics,” he told the Globe and Mail in 1999. Wilson first arrived at U of T in 1955 to study at Trinity College, earning a degree in commerce. Soon after, Wilson landed a job in Ottawa working in the finance department and then worked his way up the ladder on Bay Street. Mulroney says he first crossed paths with Wilson in the 1970s. While the two may have started off as acquaintances, it wouldn’t be long before their lives would become intertwined on the national stage. After being elected to Parliament in 1979, Wilson ran for the leadership of the Progressive Conservative Party in 1983, challenging Mulroney and a half dozen other contenders. Wilson ultimately stepped aside and threw his support behind Mulroney and was rewarded with his senior cabinet post as finance minister. He would also serve as a minister for international trade and a minister of industry, science and technology. “I was extremely grateful to him, obviously, but he then went on to play an extremely indispensable role in the government of Canada,” Mulroney says. Joe Martin, an adjunct professor at U of T’s Rotman School of Management, cites the creation of the Office of the Superintendent of Financial Institutions, or OSFI – Canada’s banking regulator – under Wilson’s watch as a yet another signature achievement. During the 2008 financial crisis, when the world’s financial institutions were imploding, “the thing that saved the Canadian markets was the fact that we had OSFI in place,” Martin says. Wilson had a front row seat during this period, too, having been tapped by Stephen Harper’s government to serve as Canada’s ambassador to the United States, a position he held for more than three years. On a personal level, those who knew Wilson well describe him as a person of principles and integrity, and someone who placed a high value on education. “Michael fundamentally believed in the value of education and learning,” President Gertler told CBC. “He used to say at our convocation ceremonies that students should use their learning throughout the rest of their lives to make the world a better place – and to leave every situation they came into contact with in better shape than it was when they found it. For those working in the field of mental health, meanwhile, Wilson’s legacy is described as nothing short of game-changing. Until he came along, it was difficult to get people in the corridors of power to pay attention, says Dr. Paul Garfinkel, a professor and former chair of U of T’s psychiatry department. In his role as CEO of the Clarke Institute, one of the facilities that merged into the Centre for Addiction and Mental Health, Garfinkel says he struggled to find donors and people to join the hospital’s board. “You can’t imagine how lonely it was. We could have board meetings in a phone booth,” Garfinkel says. Wilson opened the door to glass tower boardrooms in Toronto and Montreal as well as government offices in Ottawa. When he spoke, people around the table listened, Garfinkel says – in part because most already knew him. Wilson led multimillion-dollar fundraising campaigns, served on provincial task forces on mental health and, in 2015, became board chair of the Mental Health Commission of Canada. “He was a real mentor and I learned so much from him,” says Louise Bradley, the president and CEO of the commission. Under his tenure, the board was restructured to include more people with backgrounds in finance, law and a lived experience of mental illness. He also helped increase the representation of Indigenous people, Bradley says. At U of T, Wilson was instrumental in finding support for a chair in depression studies named in memory of his son. Dr. Robert Levitan, a professor of psychiatry and physiology in the Faculty of Medicine and senior scientist at CAMH, currently holds the chair. He’s an expert on atypical subtypes of mood disorders characterized by depressed mood and eating behaviour. Wilson could be blunt and didn’t sugar coat the need for change, Goldbloom says. “I think Michael definitely thought we were making progress.